54 • June 2018 • S I G N & D I G I T A L G R A P H I C S DIGITAL PRINTING AND FINISHING DIGITAL GRAPHICS Choose the Brush tool and a soft edged brush. On the layer mask, paint out the areas that you don't need while you soften the edge of the mask. Reduce the opacity and the size of the brush to accurately blend the new content with the original. Color Adjustment It's often necessary to perform a color adjustment to better match the color of the original. In this case I used Hue/ Saturation and a Curves adjustment lay- ers to balance the colors. The two adjust- ment layers are "clipped" to the Eye layer so that they only affect the color of the Eye content below them (see Figure 6). To clip the layers, place the cursor between the layers and press Opt (Mac) or Alt (Win) and click. Figure 7 shows the completed composite. Missing Persons A group shot can present difficulties if an important individual who, for one reason or other cannot attend the initial photo shoot. They'll need to be inserted later, and that requires a separate photo shoot. 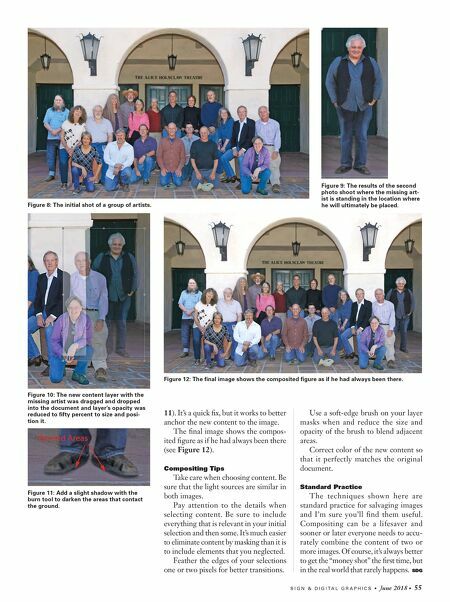 If the initial group shot was taken outdoors, the rescheduled shot should be taken in the same location, at the same time of day, under similar lighting con- ditions. Compositing an outdoor group has its own unique set of challenges. If you can decide where the missing person will be inserted beforehand, at the initial shoot, then you can plan to leave a space for them. More frequently however, you don't have that luxury. It's easier to place them in front of the group, but sometimes that can appear awkward. Closer to the back requires that you limit content by masking. Finding a simple background for your subject will make compositing easier. Figure 8 shows the initial shot of a group of artists. You can see where the photographer left a space on the right for the missing member. Figure 9 shows the results of the second photo shoot, where the missing artist is standing in the loca- tion where he will be placed. The work of compositing has been substantially simplified by shooting against a relatively simple background—the green door, the terrazzo tiles and the white column. The new content layer with the missing art- ist was drag-and-dropped into the doc- ument and the new layer's opacity was reduced to 50 percent so that the figure can be sized and accurately placed (see Figure 10). An accurate layer mask was traced. Finally, the new layer's opacity is increased to one 100 percent. Shadows The most common mistake when compositing an image is that the new content seems separate and does not look anchored to the ground, or it looks as if it's been simply pasted onto the original. An easy way to avoid this problem is to select enough of the background where the figure stands so that the natural shadow in included. 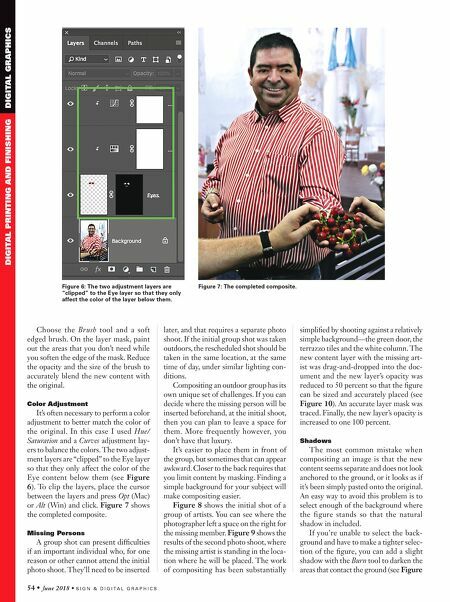 If you're unable to select the back- ground and have to make a tighter selec- tion of the figure, you can add a slight shadow with the Burn tool to darken the areas that contact the ground (see Figure Figure 6: The two adjustment layers are "clipped" to the Eye layer so that they only affect the color of the layer below them. Figure 7: The completed composite.